Happy Tuesday everyone. 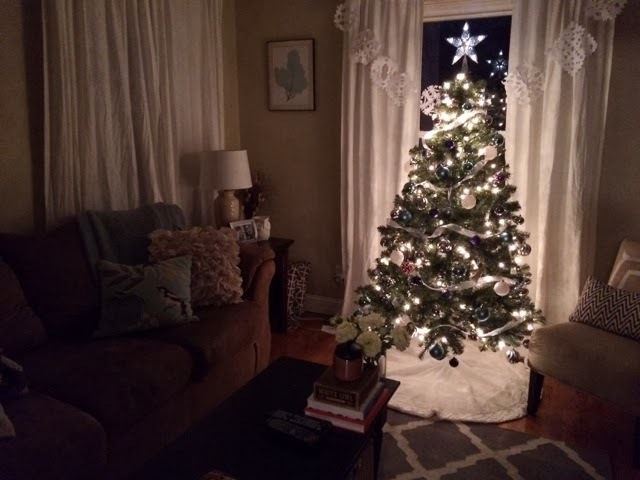 I'm back with an update on the foundation issues, and I also have some new living room pics, all decorated for the holidays! First...the foundation. Yesterday while I was at work and Trent was home, a couple of head people from the foundation company came back to talk about what they could do to fix the problems they left us with. Trent explained again all of the issues we still have, and they just offered to dig it out again and put on the waterproof membrane they forgot to do that was in the contract, and fill in the joints between some of the cement blocks they forgot to fill. They told us the membrane wasn't necessary and was mainly for houses that had more than just a crawl space. So they said they could either put it in, or give us our money back, since it was in the contract and we paid for it. Trent told them he didn't want them working anymore on it and that we just want the money back. Basically we're just tired of dealing with it and want it to be over! They also offered to fill in the cracks they forgot to mortar between the blocks, and Trent said he would just do it himself. They left a bag of mortar for us to use. The bigger issues like the gap between the house and the wall, the rotted board they screwed into, and not wrapping around the corner we are basically left to fix this spring. After a lot of discussion and letting them know all of our frustrations, it was left at how much more money they are going to give us back for their mistakes. They left and said they would get back to us either tomorrow or the next day. We haven't heard anything back yet today, so were expecting a call tomorrow. I'm really just ready to be done, but would definitely like something in return for all of our headaches throughout the process. Looking on the bright side, the good part is that we have a brand new wall on that side of the house. But the bad part is that were left with a shoddy job, and will have a lot of work to do when the weather gets nice again. So....that's where we're at now. 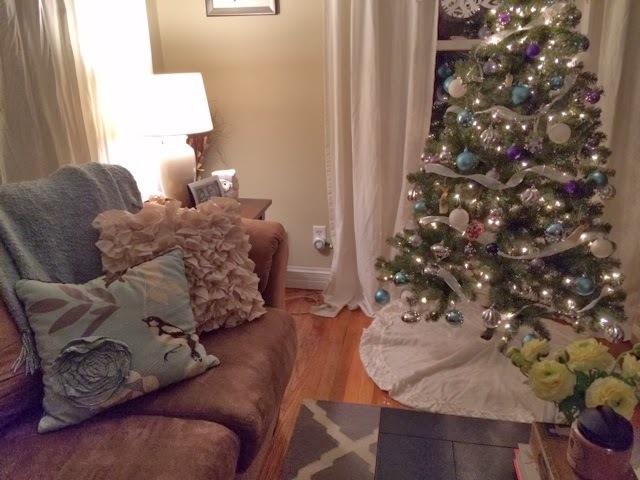 On to something lighter....Here's some more living room Christmas decor! Notice anything different? I got new pillows for the couch. And I LOVE them! 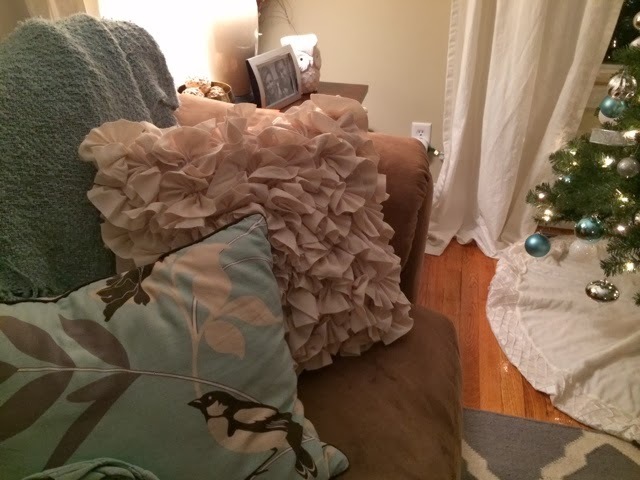 The cream-colored ruffly pillows are the new loves! 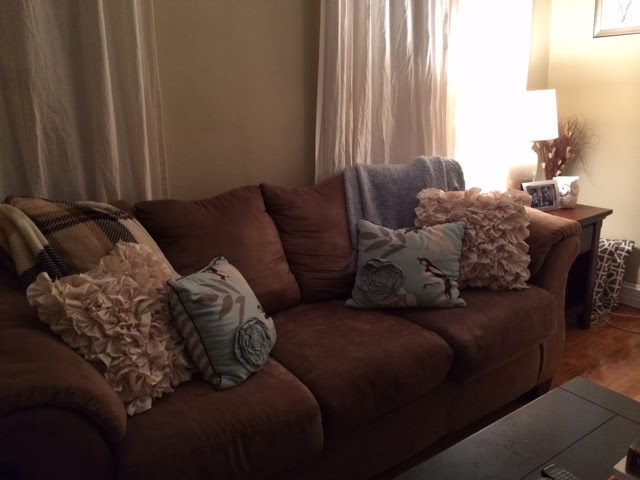 I picked them up at TJ Maxx this past weekend, and I had originally planned on getting them to switch out my turquoise pillows, but they ended up looking really cute together. They are a perfect wintery mix! 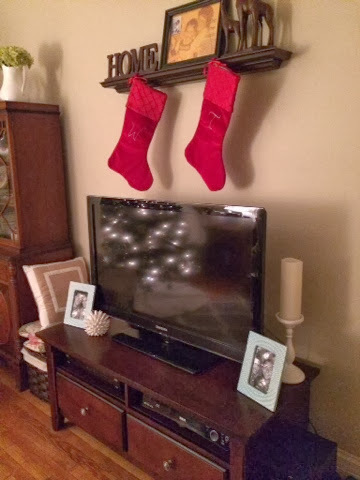 Once again we hung our stockings up on our "mantle shelf". Really the only Christmas decor we have in the living room is the tree and snowflake garland, and the stockings. But since it's such a small room, that's really all we need to make it feel cozy and all decked out for the holidays! Nothing beats the glow of the tree. One of my favorite things about this time of year!